If you are looking at a Medicare Supplement Plan that does not cover the Part B excess charges (like a Plan N), you need to know exactly what they are and how to avoid them. There are some states that do not allow these charges and we will list them further along in this article. The Part B Excess Charges, can be charged when a doctor accepts Medicare but is not assigned by Medicare. 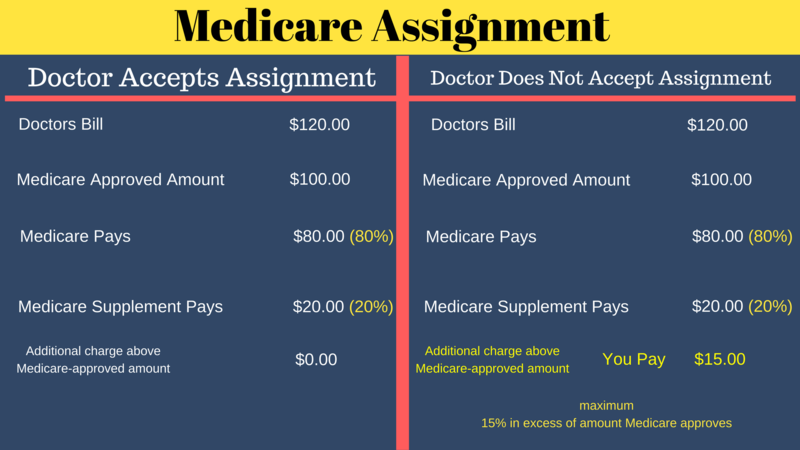 Medicare Assignment means that the doctor will accept the Medicare approved amount as payment in full. If the doctor does not accept Medicare assignment, in most states they can legally charge you more over and above the Medicare Approved amount. There is a limit on what they can charge for the Medicare Part B excess charges, due to the "limiting charge" they can only charge 15% more than the Medicare approved amount. What Can Happen If A doctor does not accept Assignment? You could be required to pay the entire charge at the time of service. After you pay the provider should submit a claim to Medicare for your reimbursement. You could be charged 15% over the Medicare Approved amount. This is at the providers discretion and is termed as the Part B excess charge. The easiest way to avoid the Medicare part B excess charges is to only use providers that accept Medicare assignment or to have a Medicare Supplement that covers this, such as the Medigap Plan G.
You need to have a conversation with your doctor about Medicare and also question other medical providers, if they accept Medicare assignment. If you live in one of the above states you will not have to worry about the Medicare Part B Excess Charges, any doctor that accepts Medicare, must accept Medicare approved amounts as payment in full. This makes the Medicare Supplement Plan N an attractive plan. See more detail on the Plan N here. Realistically, the Part B Excess Charges do not happen that often, but you still need to be aware that it can happen. Presently, approximately 96% of physicians accept Medicare Assignment and it is actually more profitable for them to accept the Medicare charges. Medicare only pays 95% of the fee schedule to non-participating providers. We are here to answer any question you might have just call us at 844-528-8688 or you can email us from our contact us form. There is also a live chat box at the bottom of the is page for quick answers. We proudly serve 43 states and carry over 20 Medicare Supplement companies. Remember as an independent agency, we do not work for an insurance company, WE WORK FOR YOU!